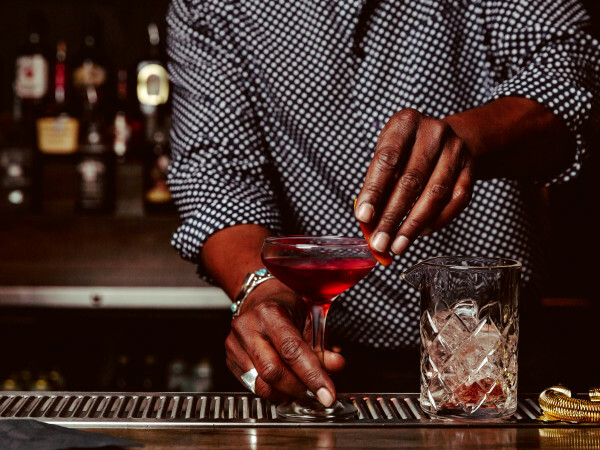 Editor's note: In this exclusive new CultureMap series, contributor Tyler Pratt spends the evening getting to know some of Austin's biggest personalities. We kick things off with Austin's barbecue master — and beer connoisseur — Aaron Franklin. You know Aaron Franklin. You’ve stood in his barbecue line for hours or been lucky enough to have a friend bring it to you. (Maybe he’s even personally sliced up the mouth-watering brisket after the long wait, throwing in some bonus fatty cuts with a wink.) No doubt you’ve read about him in any one of countless publications or seen his signature horn-rimmed glasses and giant grin on TV. At the very least, you’ve heard of him. He’s 36-years-old, already an Austin legend, and he makes some of the best damn barbecue in Texas. But this isn’t a story about the merits of Franklin’s brisket or a claim that his restaurant serves the best barbecue ever. This is just about beers on one of those amazing Austin evenings where the weather is perfect, the mosquitoes aren’t too aggressive and you fall in love with the city all over again. Franklin loves beer. 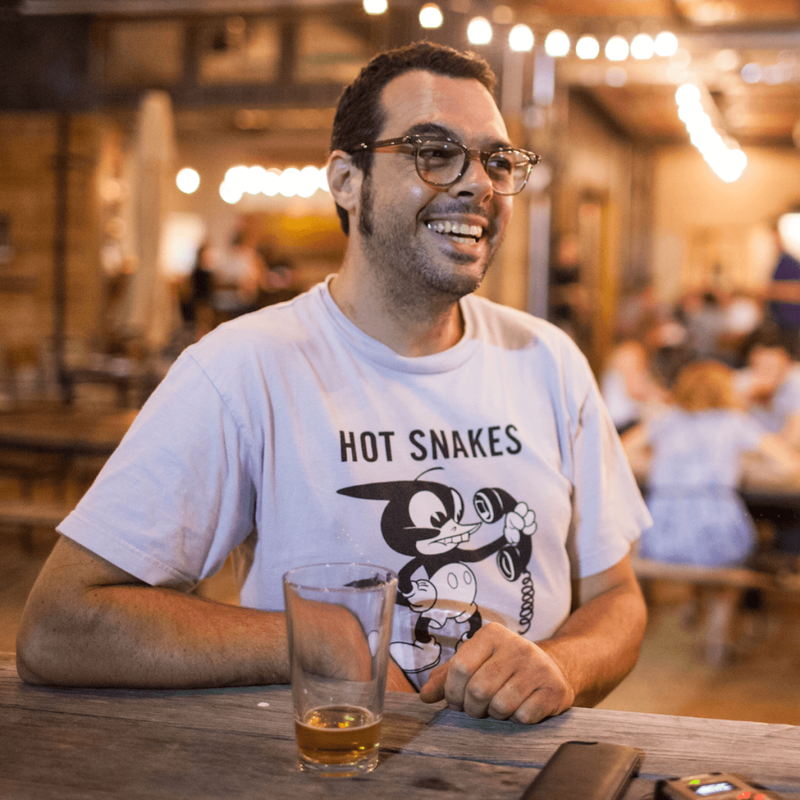 He’s well-versed in Austin’s brew scene and used to spend his afternoons grabbing drinks and eats with friends and enjoying a variety of Austin establishments. But with a restaurant that keeps him working seven days a week; a 1 am wake-up time; and his first child, daughter Vivian; he keeps busy to say the least. Still, he jumped at the opportunity to hang out over beers and show me a few of his favorite haunts. During the evening, Franklin barely stops smiling. Dressed in a T-shirt and shorts, he’s affable, quick to laugh and even faster with a joke. And there's never a lag in the conversation. You might think an upbringing in barbecue is where his love affair with brisket and ribs began. But it would be a long time between working in his parent's restaurant and when his passion for barbecue kicked in. All that changed not long after his met his wife, Stacy. The two were introduced at a bar on West Sixth Street and immediately hit it off. When they moved in together, Franklin realized he needed to buy a grill. He experimented with cooking briskets, his dad offering the sage advice, “Cook it until it’s done.” According to Franklin, the first batch wasn’t very good. But he kept at it. Soon, it became a social thing, for example cooking for his friends after shows. “It was fun sitting around a fire, it was kind of nostalgic. It reminded me of being a kid down at my parents’ place, poking at the fire — it smelled the same.” And the rest is history. Franklin’s friend Big Jeff got him to taste Bobby Mueller’s barbecue, which he says was a game-changer; he later went to work for Bobby’s son, John (which is a story unto itself). As time progressed, Franklin’s brisket technique improved. His barbecue get-togethers grew in size, so much so that they became social calendar events for a growing group of friends. The sheer amount of brisket he was preparing led to the purchase of the famous smoker, followed by the risky move of opening a trailer, and then the even riskier endeavor: the brick-and-mortar. 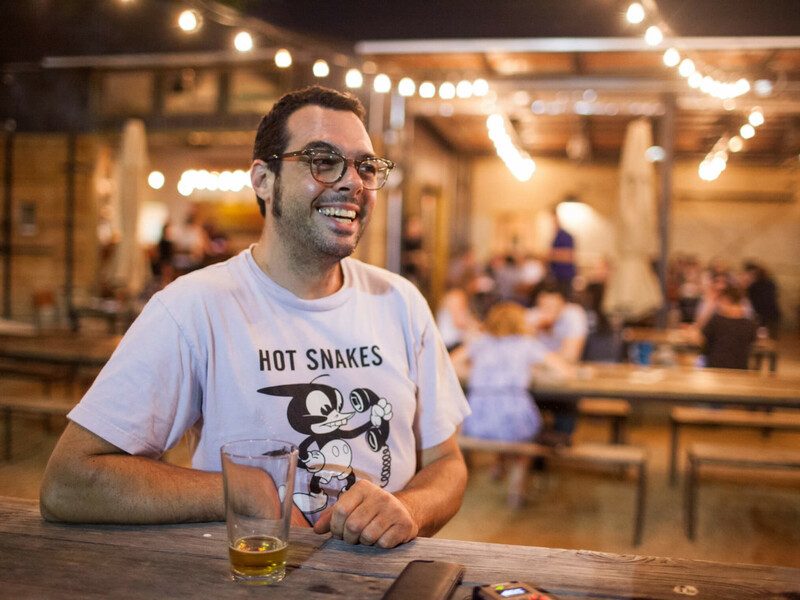 Halfway through reminiscing his journey, a bar patron teeters over to ask Franklin about his shirt, which features a logo for the band Hot Snakes. Franklin flashes his big smile and makes easy conversation. The two laugh, trying to figure out what the Mickey Mouse-esque character on his shirt is. “It’s weird, I randomly grabbed this, but almost every day I have some type of beer shirt on,” he laughs. "I’m some dude that used to sleep on the floor, playing rock ‘n’ roll and drinking Pabst. And now I get to make barbecue? And actually own a house? That’s pretty cool." It’s here at Black Star that Franklin is most indecisive about his beer selection. We taste a few and he opts for Black Star’s Rebellious Dockhand. We sit on the patio and he explains what he looks for in a beer. When he can, Franklin likes to eat out. One of favorite restaurants? Uchiko. “The coolest thing about Uchiko is that is Tyson [Cole] is back there, he’ll just whip something up. 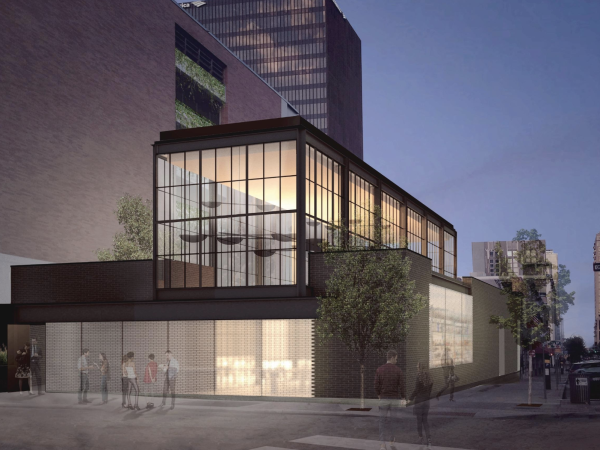 I’ll be like, ‘Man, this is the most amazing thing I’ve had in months!’ and he’ll be like, ‘Yeah, I just threw it together.’” His other staples include Contigo, La Condesa, Torchy’s and Tamale House. And when it comes to barbecue, he names Louie Mueller’s without skipping a beat. He also cites Snow’s BBQ in Lexington and the “perfectly cooked porkchop” from Kreuz’s Market in Lockhart among his favorites. Still, there has to be a secret. There’s got to be more than just salt and pepper, right? 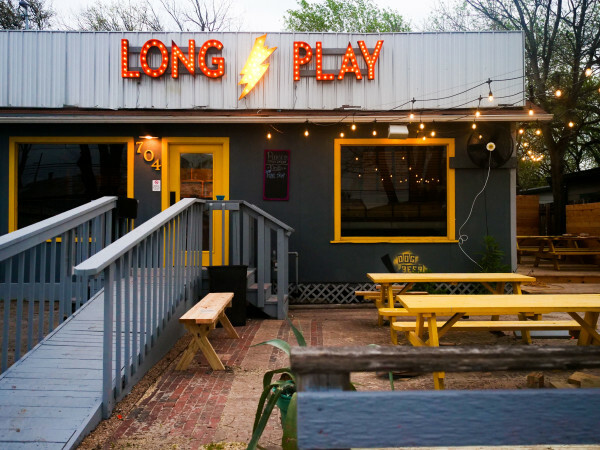 "Austin has traditionally harnessed people that are passionate, people that are artistic … Austin has always been a pretty liberal, accepting place. And I feel like that spirit is dying rapidly." At Contigo, everyone again knows Franklin. He hasn’t been around much since Vivian was born, so the staff is excited to see him. He gets wrapped up in conversations that range from the career paths of drummers from obscure indie rock bands in the ‘90s to how he can help a bartender entertain some family in town for a wedding. After some debate, he decides on Hops and Grain Brewery’s The One They Call Zoe. We settle in at a standing table and talk about what it was like working with Anthony Bourdain and then later Chef Nobu, for what I thought was an American Express commercial. “It’s funny that you say that,” he says. “It’s not even American Express. Everyone gets it wrong. It’s Chase Sapphire.” Franklin goes back to something we talked about earlier in his truck. The restaurant doesn’t do any PR and has never spent any money on marketing. He continues to credit all the success to hard work and passion. “See, my point is,” he laughs, “they spent who knows how much money on this silly commercial and all this marketing and no one knows what card it’s for.” Franklin adds, however, the commercial did afford him the opportunity to buy the restaurant a much-needed walk-in cooler. Franklin hopes people continue to invest in the spirit of what made Austin so great, and he hopes his business offers some of that identity: a place with an old-school vibe, where people can hang out, get a beer and a meal. Which is why he says he won’t franchise, move or even open a second location. Not to say that Franklin’s location doesn’t come with aches. He and his team, which is mostly made up of close friends and family, feel the literal pains of all the work in their knees and backs. But, that’s not a reason to outsource and sell. Franklin ponders the future over the last bit of pale lager in his glass.